MINNEAPOLIS & REHOVOT, Israel--(BUSINESS WIRE)-- Stratasys Ltd. (Nasdaq:SSYS), the 3D printing and additive manufacturing solutions company, today announced enrollment is now open for 3DHEART, an investigator initiated trial. 3DHEART, which stands for 3D Hearts Enabling A Randomized Trial, is a randomized, single-blind clinical trial to study the use of patient-specific 3D printed models in pre-operative planning for pediatric heart surgery. Stratasys is providing in-kind support with printing of the models to be used in the trial. The study is being led by physicians from New York-Presbyterian/Morgan Stanley Children's Hospital, Children's Hospital of Philadelphia, Children's National Medical Center, and Phoenix Children's Hospital with up to 20 additional sites in the US. The study will focus on pediatric congenital heart patients requiring complex two-ventricle repair. The primary endpoint being studied is cardiopulmonary bypass time with secondary endpoints including the prevalence of surgical complications (morbidity), mortality, and physician assessment of utility. The study is being managed by OpHeart, a 501(c)3 nonprofit organization whose mission is to improve the odds and outcomes for children born with life-threatening heart defects. "This study is incredibly important because it will finally quantify what we know from firsthand experience: 3D printed patient-specific models improve surgery, improve outcomes and result in lower treatment costs," said Dr. Yoav Dori, Pediatric Cardiologist, Children's Hospital of Philadelphia. "If we can empirically demonstrate this, it will be a game-changer for treating not only children with congenital heart defects, but patients across the board." The study will enroll 400 pediatric patients in total. 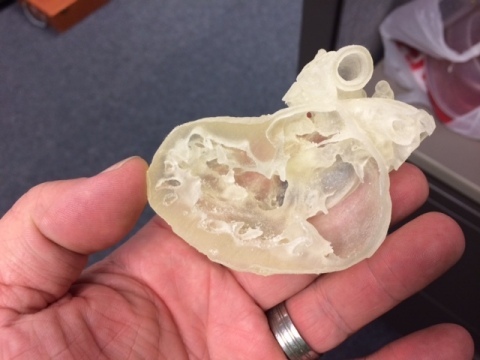 Stratasys Direct Manufacturing, one of the world's largest 3D printing and advanced manufacturing service providers, is 3D printing heart models for 200 patients on Stratasys Connex multi-material, full color 3D Printers. These models are based on the patients' MRI or CT scans and enable the surgeon to evaluate and "practice" on an accurate replica of the patient's heart prior to actual surgery. The results of these 200 patients are being compared to the results of 200 patients who are being treated without the aid of 3D printed heart models. "Stratasys is proud to be part of this historical study which for the first time will provide tier 1 data evidence on the potential benefits of using patient-specific, 3D printed surgical planning models," said Scott Rader, General Manager, Healthcare Solutions, Stratasys. "We are committed to advancing the use of 3D printing for a variety of medical applications, including anatomical models, medical device prototypes, and prosthetic devices. Gathering this kind of data will raise awareness for the advantages our customers report seeing on an individual patient basis, including better planned surgeries with faster recovery times." "Stratasys Direct Manufacturing is honored to contribute to such an impactful study with the potential to revolutionize surgical planning and change patients' lives for the better," said Greg Reynolds, VP of Additive Manufacturing at Stratasys Direct Manufacturing. "We understand the critical nature of this work and we've worked with the study investigators to develop a robust and responsive production process that puts these models in surgeons' hands in as little as three days." "Stratasys' participation in the OpHeart clinical study is a vital part of our Corporate Social Responsibility (CSR) program, aimed at shaping lives and making a difference by improving medical procedures, equipment, and processes," said Arita Mattsoff, VP Public Relations & Thought Leadership and Responsible for CSR at Stratasys. "3DHEART is a perfect example of this kind of initiative, leveraging advanced 3D printing applications to potentially improve surgical outcomes." "This study is truly extraordinary, in that it is a ‘village' effort. Doctors have seen firsthand how 3D-printing can save lives, but have not had the resources to quantifiably substantiate heretofore anecdotal evidence. This study will do that. I am proud to work with such an esteemed group of clinicians and industry leaders to improve the lives of children like my daughter, and thank Stratasys for their unwavering support," said OpHeart Executive Director, Anne Garcia. For more than 25 years, Stratasys Ltd. (NASDAQ:SSYS) has been a defining force and dominant player in 3D printing and additive manufacturing - shaping the way things are made. Headquartered in Minneapolis, Minnesota and Rehovot, Israel, the company empowers customers across a broad range of vertical markets by enabling new paradigms for design and manufacturing. The company's solutions provide customers with unmatched design freedom and manufacturing flexibility - reducing time-to-market and lowering development costs, while improving designs and communications. Stratasys subsidiaries include MakerBot and Solidscape, and the Stratasys ecosystem includes 3D printers for prototyping and production; a wide range of 3D printing materials; parts on-demand via Stratasys Direct Manufacturing; strategic consulting and professional services; and the Thingiverse and GrabCAD communities with over 2 million 3D printable files for free designs. With more than 2,700 employees and 1,200 granted or pending additive manufacturing patents, Stratasys has received more than 30 technology and leadership awards. Visit us online at: www.stratasys.com/medical or Stratasys Medical Blog, and follow us on LinkedIn Healthcare Showcase.